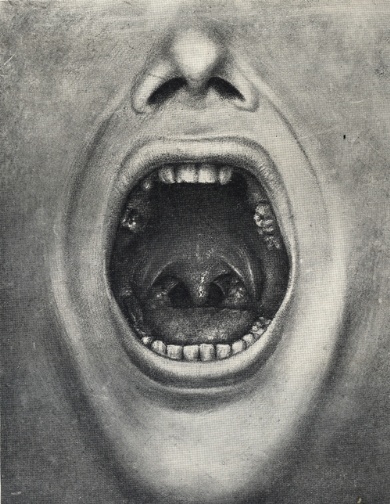 This illustration of a mutilated mouth is not the result of a road accident, but that of a doctor’s obsession with an utterly bizarre theory of insanity—a theory that left hundreds of his patients dead and thousands maimed for life. Dr. Henry Cotton was the medical director and superintendent of the Trenton State Hospital, a large lunatic asylum in New Jersey. Before returning to the US to accept the position as medical director at a young age of 30, Cotton had studied psychiatry in Europe under two legendary figures of the time, Emil Kraepelin and Alois Alzheimer. He was also a student Dr. Adolf Meyer of Johns Hopkins School of Medicine. All of these men were pillars in the field of psychiatry, especially Meyer who was one of the first to recognize that psychiatric problems are problems of human personality rather that of the brain. Meyer also recognized that an individual’s activity and mental health are connected, and he advocated therapies, community services and change in a person’s daily life, environment, and habits as part of the treatment. Despite his revolutionary teachings that have become so solidly incorporated into modern psychiatric theory and practice, Meyer also harbored the idea that mental illness could also be caused by bacterial infection, based on the observation that patients with high fever often turn delusional or begin hallucinating. Henry Cotton was enamored by the idea that germs are the root of all mental illness. In 1913, when reports confirmed that the bacteria that caused syphilis gave patients brain lesions that led to psychiatric symptoms and dementia, in the most severe of cases, Cotton was emboldened. Shortly after, he began implementing his theories on the inmates at Trenton State Hospital. At that time, the invention of penicillin was another decade away, and the only way to eliminate an infection was to surgically remove the infected organ. Cotton attacked the teeth first and slowly began to work his way towards other organs. The mouth, he reasoned, was the most obvious place were germs lurked. So he started by removing infected teeth, unerupted teeth, teeth with cavities and abscesses. He even had his own teeth pulled out, as well as that of his wife and two sons, as a prophylactic measure to avoid the risk of infection. When pulling teeth didn’t cure his patients, he doubled his efforts and in the process removed their tonsils and sinuses. If a cure was still not achieved, other organs were suspected of harboring infection. Soon patients got relieved of their spleens, colons, testicles, ovaries, gall bladders, and other organs. New Jersey state lunatic asylum, Trenton. Out of every three patients Cotton operated on, one died. Cotton attributed the deaths to poor physical condition of the patients due to chronic psychosis. Among those who survived, Cotton claimed a high success rates of 85 percent, a statistic that gained him a lot of praise from the scientific community. Desperate for relief, many affluent men and women afflicted with mental illness flocked to Trenton to seek Cotton’s miraculous cures. Many, however, had to be dragged, kicking and screaming into the operation theater. Sometimes even families were not informed. Meanwhile, at Johns Hopkins School of Medicine, Dr. Adolf Meyer directed Phyllis Greenacre, who recently joined as staff, to conduct a study to evaluate Cotton's work at Trenton in hopes of getting a glowing report on his former student’s work. The moment Greenacre stepped inside Trenton she had a feeling of dreariness. The institution had “that sour, fetid odor so characteristic of mental hospitals,” she wrote on her report, and Cotton himself, she found, “singularly peculiar”. Greenacre was mostly disturbed by the appearance and behavior of the psychotic patients. All their faces were sunken and their speech was slurred because none of them had any teeth in their mouth. Greenacre found the hospital records were chaotic and the numbers that Cotton so frequently used to exemplify his methods didn’t quite add up. Greenacre discovered that very few patients actually recovered, and those who did were not correlated to the surgeries, and that significantly more patients died than Cotton admitted—nearly half. Unfortunately, the months of labor Greenacre poured into the investigation went to naught. When Adolf Meyer read Greenacre’s damaging report, he was scandalized, and in an effort to save Cotton’s career, refused to publish her findings. Cotton retired from the State Hospital and opened his own private hospital in Trenton where he continued butchering his patients. By the time he dropped dead of a sudden heart attack on May 8, 1933, he had killed hundreds. Meyer wrote a flattering obituary on his death, despite knowing that Cotton was responsible for the deaths of untold number of patients. Cotton’s own sons were victims of this manic doctor. Both committed suicide in middle age.